It's a bit dreary here today, so we're excited that we're going to be sending out some swag sunshine to one of our Facebook friends! The lucky winner of our weekly Friday giveaway is Cy Swendsen from Pensacola, FL! Congrats CY! We'll be mailing your prize shortly! In the meantime, don't forget we're sponsoring another pillowcase drive for Conkerr Cancer, all the details are here: Valentine Pillowcase Drive. You still have time to get yours in! There's nothing better than curling up with a good magazine during those cold winter months, right? 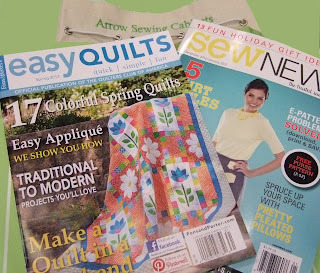 We'll be sending out these great magazines to one of our Facebook friends, we sure hope she finds some time to relax and enjoy them! Our lucky winner is Michelle Defenderfer from Moore, OK! We'll be mailing your prize shortly! In the meantime, don't forget we're sponsoring another pillowcase drive for Conkerr Cancer, all the details are here: Valentine Pillowcase Drive. We were amazed at some of the responses we received when we asked all of our Facebook friends what they were sewing on! Kitchen tables, a piece of plywood, and an end table were just a few of the answers we received. 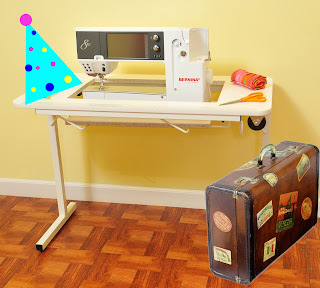 We believe that having the right sewing table/cabinet can make a world of difference, so if you're not sewing on an Arrow or Kangaroo cabinet, we want to give you the chance to win one! 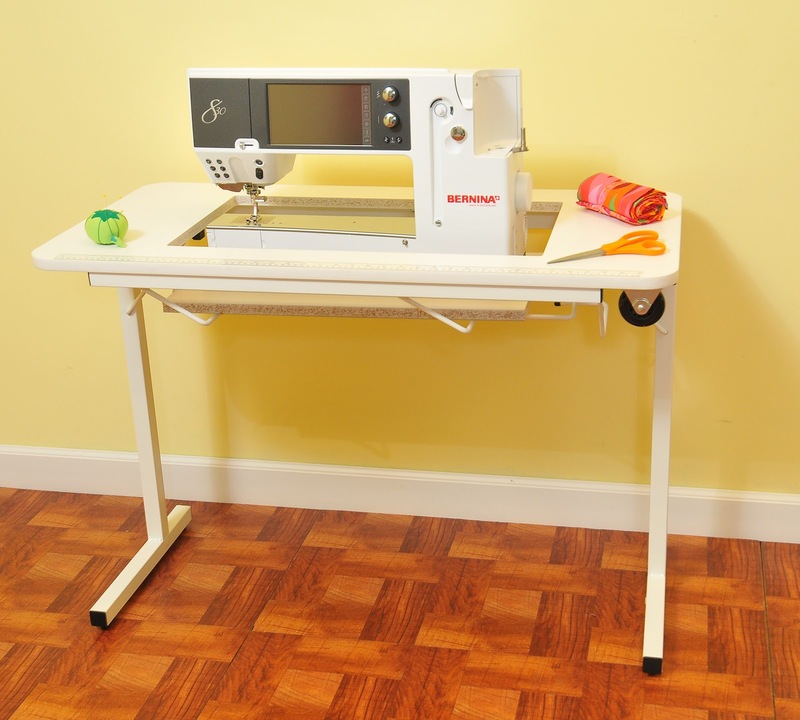 That's right, we'll be giving away a Gidget II sewing table to one of our lucky Facebook Fans! 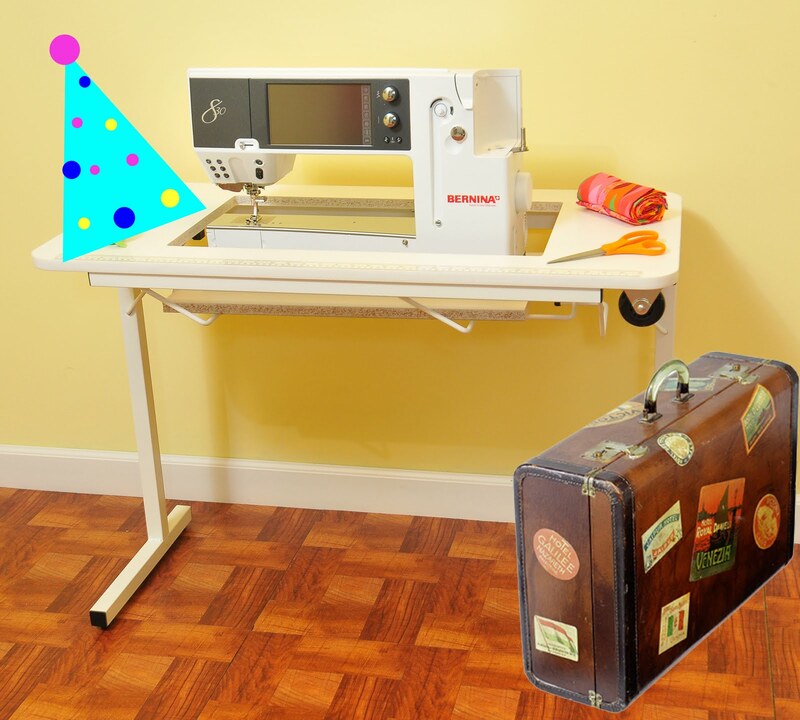 To enter, all you have to do is email us a picture of your current sewing area, and we'll choose a winner from the entrants. Just follow the rules below for your chance to win! 1. 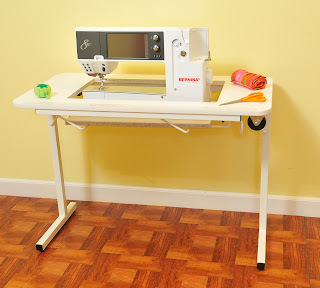 Take a picture of your current sewing setup (it must be a current photo). 2. Email it to Rebecca@arrowcabinets.com along with your name and mailing address. 3. Pictures must be received by Friday, January 25th at 5 pm Eastern time. Late entries will not be accepted. 4. Entries can only be accepted from residents of the 48 contiguous United States and from Canada. 5. The winner will be chosen by Arrow staff, and announced on our blog on Friday, February 1st. It's none other than Cathy Brecht from Alma, MI! Congrats Cathy! We'll be mailing your prize shortly! In the meantime, don't forget we're sponsoring another pillowcase drive for Conkerr Cancer, all the details are here: Valentine Pillowcase Drive. Guess what? Valentine's Day will be here quick as a wink, and we know of some kids that could really use a little Valentine cheer! Once again we're hosting a pillowcase drive for the Madison, WI chapter of Conkerr Cancer, the organization that delivers bright and cheerful pillowcases to pediatric cancer patients. To enter, all you have to do is make two cases per Conkerr Cancer's specifications, one Valentine-themed and one kid-themed, and send them to us here at Arrow. 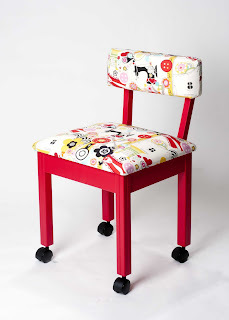 We'll pick one winner to receive our fun red Chair-y! It's perfect for Valentine's Day! We have listed the complete rules below, please read them over carefully, and if you have any questions, email us at rebecca@arrowcabinets.com. With your help, we know that we can create some Valentine smiles! 1. Make one Valentine-themed pillowcase and one child-appropriate pillowcase following the guidelines posted here on the ConKerr Cancer website: http://conkerrcancer.org/pillowdirections.html The Madison Chapter would love sports-related cases for the boys, especially Badgers or Packers ones! Remember, these are for kids, so they should be bright and cheery! 3. Cases need to be received by Friday, Feb. 8th to be eligible. 4. We will select a random winner from the eligible entries to receive a red Chair-y! Our First Swag Winner For 2013! It's Deborah Rockel from Chesapeake, OH! Congrats Deborah! We'll be sending your prize out shortly! Don't forget to check our Facebook page regularly. You never know what we'll be up to! A Winning Way To Start The New Year! Congratulations ladies! We'll be sending out your prizes shortly! And last but certainly not least, we get to pick another Gidget II winner! Look, Gidget is so excited, she's got her party hat on and already has her suitcase packed! Our winner is Genee Davis from Robinson, IL!! Congratulations Genee! We'll be contacting you shortly! Remember, to be eligible for any of our drawings, you'll need to like our Facebook page, then click on the purple "Sign Up For Our Giveaways" block located under our timeline picture. Good Luck!